I am a member of the Collective Bias® Social Fabric® Community. This shop has been compensated as part of a social shopper insights study for Collective Bias™. #CBias #SocialFabric. I've been so behind for Christmas shopping this year. Usually I'm the lady who has everything done before the end of August. So in the last couple of weeks I've been doing a lot of last minute shopping paired with last minute baking. Luckily a lot of what I've been making does freeze well. My husband and I were on a 4 night vacation at a luxury hotel for our tenth wedding anniversary when we took off to a nearby Walmart store. Since our room had a kitchen we needed a couple items for meals and of course coffee and possibly cinnamon rolls. I chose Starbucks Holiday Blend coffee to go with some cinnamon rolls. The Holiday Blend coffee was not in the bakery but in the normal coffee isle and way at the tippy-top of the shelf. It was kind of hard to find. I grabbed a few bags, one for me and two to give. Unfortunately I did not find the kind of cinnamon rolls I was looking for at the location we were at so I had to find another Walmart for those. These things must just fly off the shelf because they are so good! 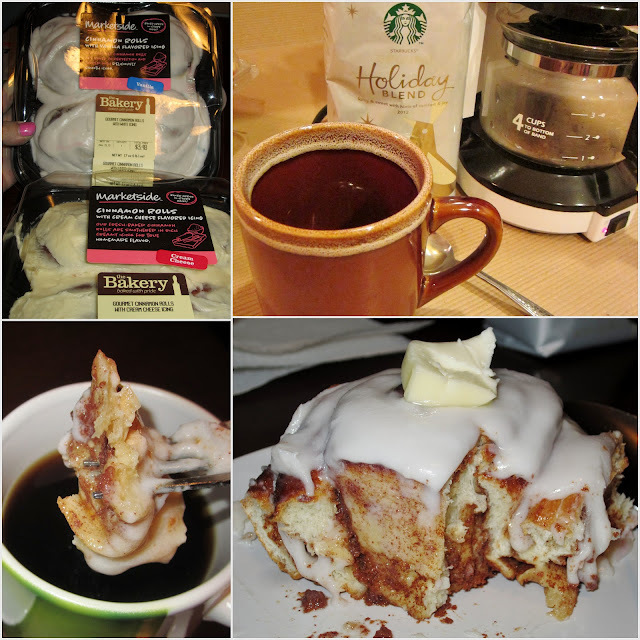 The Walmart Bakery cinnamon rolls with vanilla or cream cheese icing are simply amazing and pair well with the Starbucks Holiday Blend coffee. The cinnamon rolls have a thick, creamy icing over the top of a soft, moist cinnamon bun. One cinnamon bun is quite literally a meal. The Starbucks Holiday Blend coffee tastes dark and rich with a hint of nutmeg, allspice and vanilla to me. It is the perfect companion to those cinnamon rolls and I dunked little chunks of my roll right into my favorite coffee filled mug last night. These two things were made for each other I tell you! The coffee and cinnamon roll paired together brought out a clove, cinnamon, buttery flavor that was so phenomenal. I was shopping around online, looking for some good last minute deals on gifts. Our house gets a little chilly and I was a bit tired so I figured the hot coffee would warm me up and help to wake me up. I popped my cinnamon roll with vanilla flavored icing into the microwave for 15 seconds. Once it came out I put a pat of butter on the top and watched as it slowly melted over the top. This method makes them taste like they were baked literally seconds before they made it to the plate. The hot coffee gave me just what I needed to get some work done. 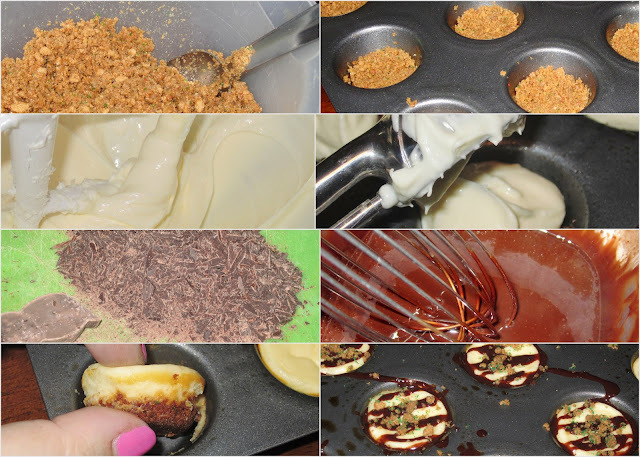 It also inspired me to think up a delicious recipe I could make to give as gifts. I was at Walmart again the day previous to me making this recipe and I found some gingerbread cookies in the bakery. I knew those would be the perfect crust for some mini cheesecake bites. The coffee would be mixed into a dark chocolate ganache to drizzle over the top. You will find my recipe below. I know you will enjoy this perfect pairing! Preheat oven to 350. Makes 24 mini cheesecake bites. PRINT this recipe! I added some green sugar to my leftover gingerbread crumbles and sprinkled this over the top. 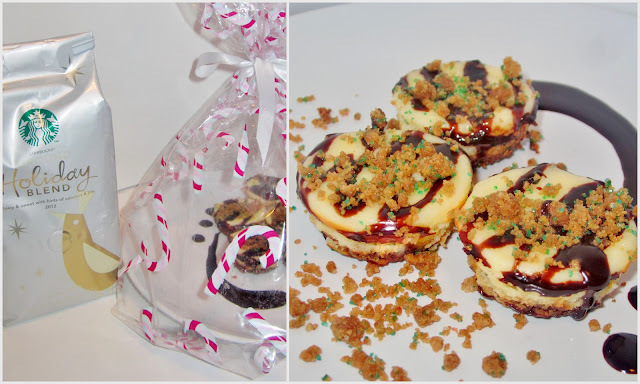 I plated up several mini cheesecakes and tied it up with a bow as a gift with a bag of Starbucks Holiday blend. On the card I wrote, "ENJOY with a hot cup of Starbucks Holiday Blend coffee. Merry Christmas!"